The Orion Underway Recovery Test 5 (URT-5) team recently celebrated the completion of the test during a gathering hosted by the Ground Systems Development and Operations Program (GSDO) and the Engineering Directorate at NASA’s Kennedy Space Center in Florida. 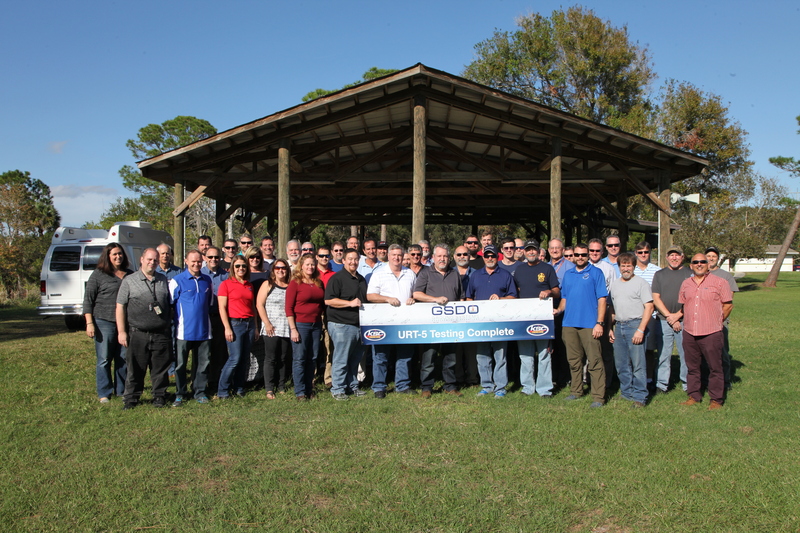 URT-5 team members included NASA’s GSDO, Kennedy’s Engineering Directorate, contractors with the Test and Operations Support Contract and Engineering Services Contract, Orion representatives, the team from the Neutral Buoyancy Laboratory at Johnson Space Center in Houston, and U.S. Air Force Detachment 3 from the 45th Space Wing at nearby Patrick Air Force Base. During URT-5 in October, the team practiced recovering a test version of the Orion crew module in the Pacific Ocean, off the coast of California, and guiding it into the well deck of the USS San Diego. Over several days, the team demonstrated and evaluated new recovery processes, procedures, hardware and personnel that will be necessary to recover Orion after its first flight test on NASA’s Space Launch System (SLS) rocket. Landing and Recovery Director Melissa Jones, with GSDO, thanked the team for countless hours of hard work and hundreds of newly developed parts that contributed to the success of the test. “This test was the first time the Landing and Recovery Team has been able to consistently demonstrate control of the test capsule in the well deck of the ship,” Jones said. The team will fine-tune their strategy, make some equipment adjustments and return to the open water for another test late next year. NASA’s Orion spacecraft is scheduled to launch atop the SLS on Exploration Mission 1 in late 2018. EM-1 will send Orion on a path thousands of miles beyond the moon over a course of three weeks, farther into space than human spaceflight has ever traveled before. The spacecraft will return to Earth and safely splash down in the Pacific Ocean. The mission will advance and validate capabilities required for the Journey to Mars.